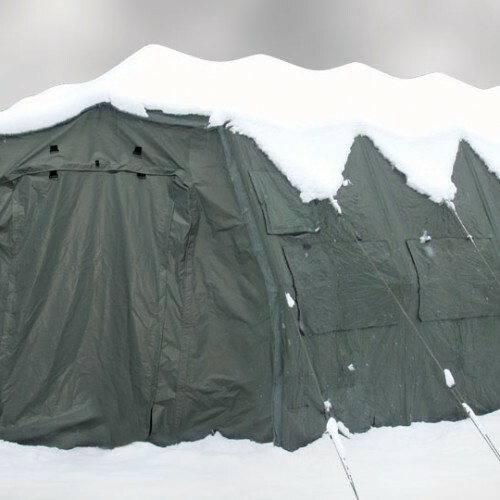 DRASH shelters are available in models ranging in size from 109 to 1,250 ft2. Available in the C, S, XB, M, J, and Specialty model series, all of HDT’s DRASH shelters are fully customizable and inter-connectable to increase or decrease an overall structure’s footprint. DRASH C Series shelters have an interior width of 11' (3.5 m) and an interior height of 7.7' (2.3 m), and come in three model sizes in four basic variants, providing from 109 to 272 ft2 (10.1 to 25.2 m2) of usable space depending on the model and the variant. 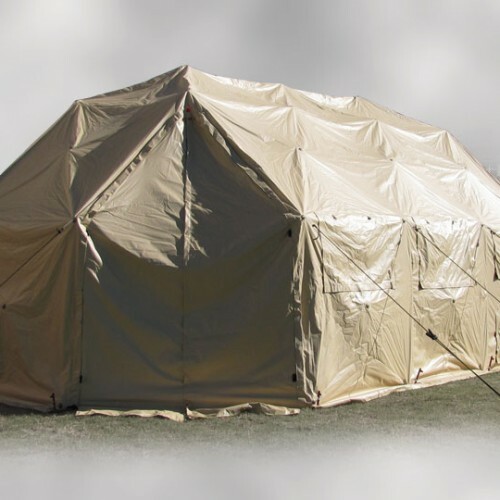 The C Variant (3 models) can be used as a standalone shelter or easily connected to other DRASH shelters using a Universal Connector Set. The Truncated, or CT Variant (3 models) can connect at one end to another T Variant for extended lengths. The CI Variant (3 models) is comprised of a midsection that can be connected on both ends for extended lengths. The Small Command Post Variant (3 models) includes flat end walls and can be integrated with a wide range of communication platforms in use today using a unique booting system. DRASH S Series shelters have an interior width of 11.5' (3.5 m). Starting at a length of 13.5' (4.1 m), S Series shelters increase in length by increments of approximately 5' (1.5 m) with a maximum length measuring up to 38.5' (11.7 m) long. The interior height is 8.25' (2.5 m). DRASH S Series shelters come in six different sizes for three different variants. The S Variant (6 models) can be used as a standalone shelter or easily connected to other DRASH shelters using a Universal Connector Set. The Truncated or ST Variant (6 models) can connect at one end to another T Variant for extended lengths. The SI Variant (6 models) is comprised of a midsection that can be connected on both ends for extended lengths. DRASH XB Series shelters have an interior width of 13.6' (4.2 m). Starting at a length of 15.3' (4.7 m), XB Series shelters increase in length by increments of approximately 4' (1.2 m) with a maximum length measuring up to 35.3' (10.8 m). The interior height is 8.7' (2.7 m). DRASH XB Series shelters come in six different sizes for three different variants. The XB Variant (6 models) can be used as a standalone shelter or easily connected to other DRASH shelters using a Universal Connector Set. The Truncated or XBT Variant (6 models) can connect at one end to another T Variant for extended lengths. The XBI Variant (6 models) is comprised of a midsection that can be connected on both ends for extended lengths. DRASH M Series shelters have an interior width of 18' (5.5m) that can be lengthened to increase an operating area by removing the shelters’ end sections and adding additional center sections. M Series shelters come in three basic models in varying lengths with the option of a Maintenance Door allowing smaller UAV’s or vehicles access into the shelter for maintenance or storage purposes. DRASH M Series shelters come in three different sizes. The MX Shelter provides 442 ft2 (41 m2) of usable interior space, is comprised of one center section that measures 17' (5.2 m) long, and includes two end sections that can be removed to add to the shelter length. The MX5 Shelter is slightly larger than the MX, providing 519 ft2 (48.2 m2) of usable interior space. It is comprised of one center section that measures 21.25' (6.4 m) long, and includes two removable end sections. Largest of the three DRASH M Series shelters, the M Shelter provides 748 ft2 (69.5 m2) of usable interior space. The shelter is comprised of two center sections, which measure a total of 34' (10.4 m) long and includes two removable end sections that can be easily removed to insert more center sections or can connect to other DRASH shelters to increase the shelter’s diagonal operational space. The DRASH J Series shelter is available as a standalone shelter, with end vestibules or maintenance doors. The interior of the DRASH J Series shelter system with the end vestibules measures 51.4' long (15.7 m) by 31.33' wide (9.5 m) and provides a total of 1,250 ft2 (116 m2) of usable space. The interior of the DRASH J Series shelter system with maintenance doors measures 58.9' long (17.9 m) by 31.33' wide (9.5 m) and provides a total of 1,323 ft2 (122.9 m2) of usable space. The interior height of the DRASH J shelters, regardless of configuration with end vestibules or maintenance doors measures 13.75' (4.2 m). 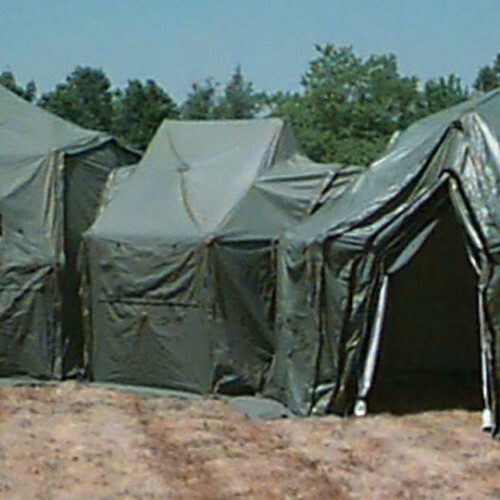 DRASH specialty shelters have been designed and created to fulfill a basic military need and are manufactured from rugged, reliable materials to hold up under the toughest conditions. Entry Control Point – The DRASH Entry Control Point offers users a secure, extended entryway in which personnel can control access into any DRASH facility. 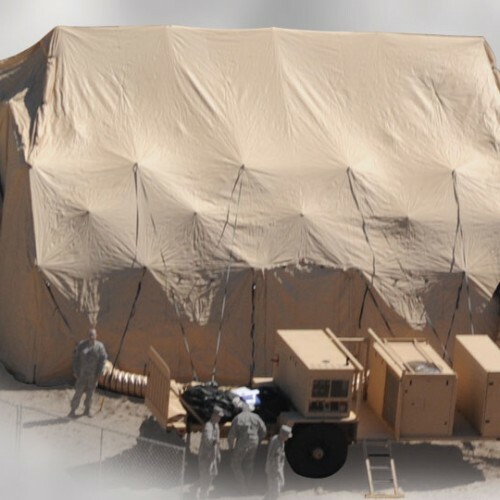 Satellite Antenna Shelter – The DRASH Satellite Antenna Shelter (SAS) provides cover and conceals satellite antennas up to 8' in diameter while providing a work area for maintenance personnel. 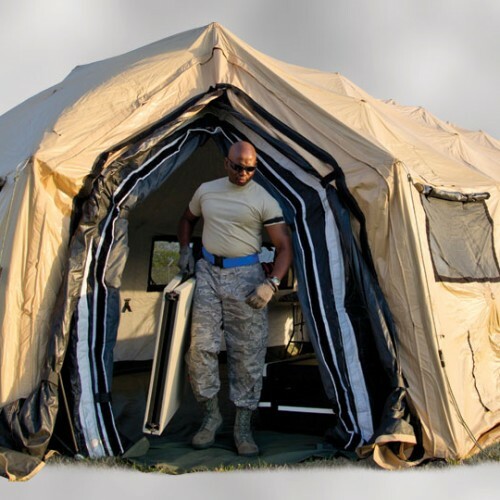 Self-Enclosed Annex Lobby – The DRASH Self-Enclosed Annex Lobby (SEAL) provides an extended entryway to any doorway of an S or XB Series DRASH shelter or between two S or XB DRASH shelters. Mobile Hygiene System, 8 Stall Complete – Able to be set up within minutes, the DRASH Mobile Hygiene System makes it possible to establish shower facilities anywhere, any time. 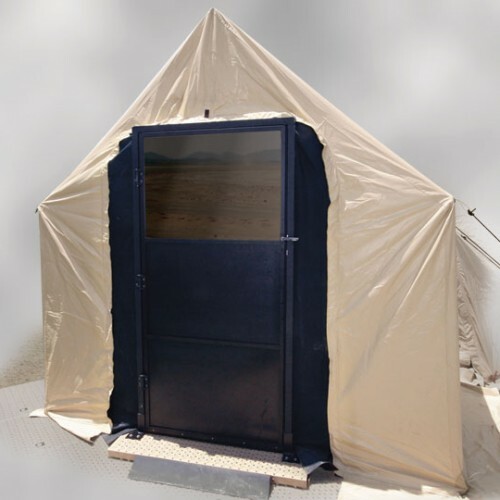 Created by combining DRASH shelter technology with a state-of-the-art water supply system, this unique, independently operational design includes private shower stalls and a common wash area with wash basins and benches. 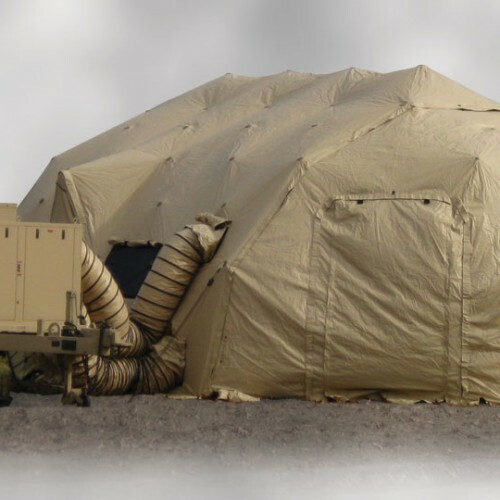 EMI Shelter – The DRASH EMI Shelter protects sensitive electronic equipment from the effects of Electromagnetic Interference (EMI), and contains Radio Frequency Interference (RFI) signals generated by equipment within the shelter. 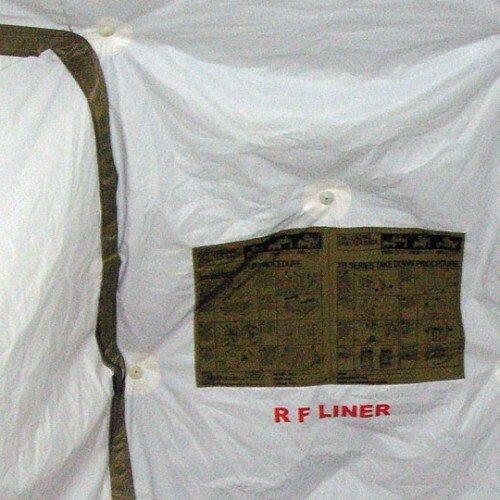 Decontamination Systems – DRASH decontamination shelters and accessories are available through our Reeves EMS product line. Visit www.reevesems.com for additional information.